A 40-year-old female was evaluated for left thyroid swelling and, after left hemithyroidectomy (p T2 N0M0) with intermediate risk as per the American Thyroid Association Guidelines, was referred for completion thyroidectomy as the final histology was papillary carcinoma. 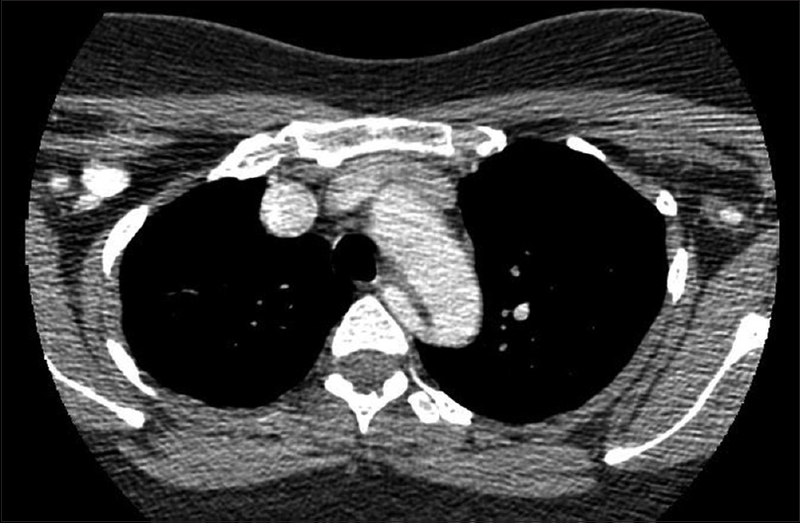 A contrast-enhanced computed tomography evaluation of the neck was done, which revealed a suspicious nodule in the right lower pole of the thyroid gland, and a mention of anomalous right subclavian artery was reported. Intraoperative findings were confirmed. Nonrecurrent laryngeal nerve (NRLN) is a rare anomaly that head and neck surgeons encounter a surprise during thyroid surgeries. However, meticulous dissection helps not only to identify but also to preserve the integrity of the nerve. However, in the era where imaging is an integral part of presurgical workup protocol, the presence of such an entity can be predicted, rather than being an on-table surprise for the surgeon. Hence, this case report intends the same. A 40-year-old female was evaluated for left thyroid swelling and, after left hemithyroidectomy (p T2 N0M0) with intermediate risk as per the American Thyroid Association Guidelines, was referred for completion thyroidectomy as the final histology was papillary carcinoma. 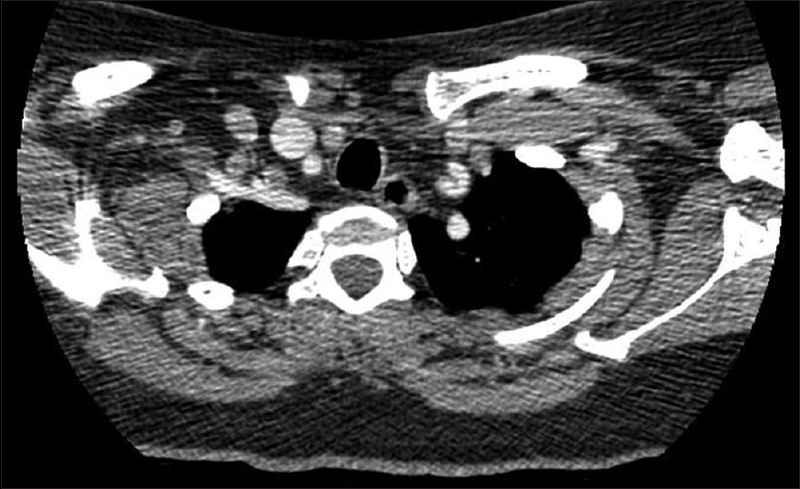 A contrast-enhanced computed tomography (CT) evaluation of the neck was done, which revealed a suspicious nodule in the right lower pole of the thyroid gland, and a mention of anomalous right subclavian artery was reported. The subclavian artery was noted to arise from the arch of aorta and traversed posterior to the esophagus to the right side as shown in the serial CT scan images [Figure 1], [Figure 2], [Figure 3]. Laryngoscopic evaluation revealed both vocal cords to be mobile. Intraoperatively, after ligating the superior pedicle and identifying the parathyroid on the left side, the tubercle of Zuckerkandl was identified and lifted after ligating the terminal branches of inferior thyroid artery close to the gland. Posterior to the branches of the inferior thyroid artery, transversely running NRLN was identified and traced till the carotid sheath [Figure 4]. Type 2B: Parallel transverse path, under the trunk or between the inferior thyroid artery branches as seen in our case. The presence of arteria lusoria can be ascertained on CT scan on identifying aberrant subclavian artery traversing posterior to the esophagus or absence of a right brachiocephalic trunk. The role of intraoperative neuromonitoring in thyroid surgery, though at its infancy due to cost constrains, can differentiate non-RLN and sympathetic anastomosis with the recurrent laryngeal nerve. Overlooking such a rarity can lead to iatrogenic injury to the nerve and vocal cord palsy causing hoarseness of voice and aspiration, and those with poor pulmonary reserve may end up in pneumonitis and ventilatory supports. Nonrecurrent laryngeal nerve is rare anomaly. However, prior prediction using CT with meticulous intraoperative dissections can prevent iatrogenic injury to the nerve by novice surgeons, avoiding further morbidity. Raj S, Deo RP, Mohiyuddin A. Nonrecurrent laryngeal nerve: An Indian documentation. Int J Head Neck Surg 2012;3:28-9. Stedman GW. A singular distribution of the nerves and arteries of the neck and the top of the thorax. Edin Med Surg J 19:564-5,1823. Defechereux T, Albert V, Alexandre J, Bonnet P, Hamoir E, Meurisse M, et al. The inferior non recurrent laryngeal nerve: A major surgical risk during thyroidectomy. Acta Chir Belg 2000;100:62-7. Henry JF, Audiffret J, Plan M. The nonrecurrent inferior laryngeal nerve. Apropos of 19 cases including 2 on the left side. J Chir (Paris) 1985;122:391-7. Marchesi M, Biffoni M, Faloci C, Nobili Benedetti R, Notari P, Mariotti F, et al. The inferior nonrecurrent laryngeal nerve: A report of 7 cases observed since 1987. G Chir 2000;21:25-8. Uludag M, Isgor A, Yetkin G, Citgez B. Anatomic variations of the non-recurrent inferior laryngeal nerve. BMJ Case Rep 2009;2009. pii: bcr10.2008.1107. Toniato A, Merante Boschin I, Pagetta C, Casalide E, Pelizzo M. A “pilot light” of the right non-recurrent laryngeal nerve. Acta Otorhinolaryngol Ital 2010;30:107-9. Devèze A, Sebag F, Hubbard J, Jaunay M, Maweja S, Henry JF, et al. Identification of patients with a non-recurrent inferior laryngeal nerve by duplex ultrasound of the brachiocephalic artery. Surg Radiol Anat 2003;25:263-9. 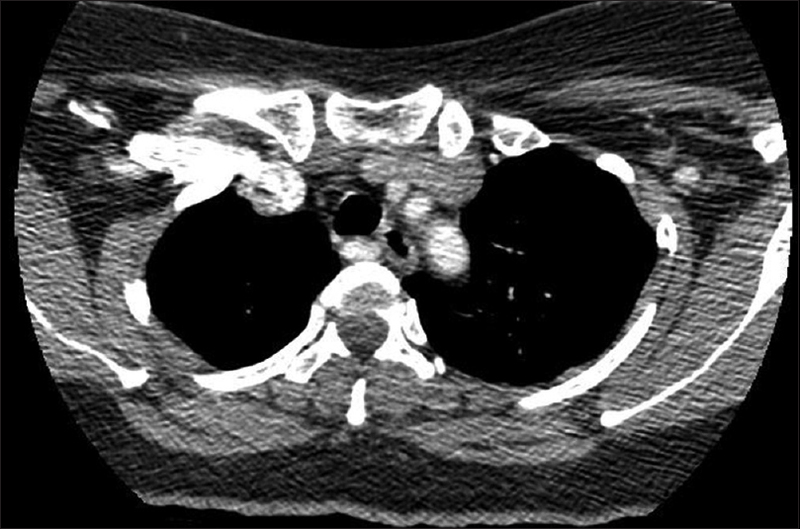 Abboud B. Preoperative diagnosis of right nonrecurrent inferior laryngeal nerve by CT scan: Report of a case and review of the literature. J Med Liban 2007;55:46-9. Casal D, Peças A, Sousa D, Rosa-Santos J. A non-recurrent inferior laryngeal nerve in a man undergoing thyroidectomy: A case report. J Med Case Rep 2010;4:386. Donatini G, Carnaille B, Dionigi G. Increased detection of non-recurrent inferior laryngeal nerve (NRLN) during thyroid surgery using systematic intraoperative neuromonitoring (IONM). World J Surg 2013;37:91-3. Lee MS, Lee UY, Lee JH, Han SH. Relative direction and position of recurrent laryngeal nerve for anatomical configuration. Surg Radiol Anat 2009;31:649-55.